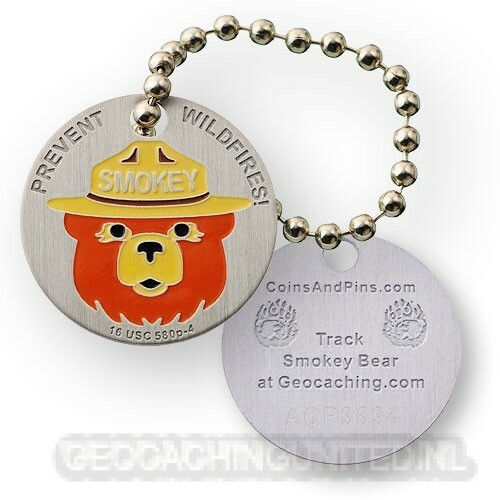 Smokey Bear tag is here to spread the word of preventing wildfires, because "Only YOU Can Prevent Wildfires Fires!" As adventurers and geocachers, we frequently hike through wilderness areas and cache in nature areas. Help protect these areas so we all can enjoy them. You can read more about Smokey Bear at SmokeyBear.com. ◾Small enough to fit in 35mm canisters. ◾An icon unique to this coin will show on your profile when you log a discovery This item is licensed to Aaron Charles Promotions LLC under 16 USC 580p-4. All rights reserved.